Want to know something really cool? My brother Patrick came to visit me on St. Patrick’s Day weekend. Wahoo! California isn’t the best place to celebrate being Irish in America. I’d say it was Pittsburgh, Pennsylvania. It’s the funnest place ever to drink green beer and go crazy. And on St. Patrick’s Day, everyone is a little Irish. But I’m so glad my brother came to California this weekend so I could try out this Guinness ice cream float! I needed someone to taste test, and Eric is not a beer drinker. This is definitely a recipe for the person who loves bold flavors. Strong coffee plus dark beer equals intense dessert. I know you are all going to hate me for this…but….it’s about 80 degrees here. Don’t be too jealous. It’s pretty awesome. As I’m typing, there’s a kid’s pool party happening across the street. People are wearing sandals and shorts. We are soaking up this sun like it’s our job! Even sandals go away for the cold season in Silicon Valley, and though we can’t really tell if it’s summer or spring, we are happy to put them back on! I’m happy to have this sunny warm weather because it means my little bro will fall in love with CA and will come to visit me again. Also, warm weather means ice cream! My ice cream maker sat on the shelf so long it had a nice layer of dust on it. It was time for some spring cleaning and ice cream making. 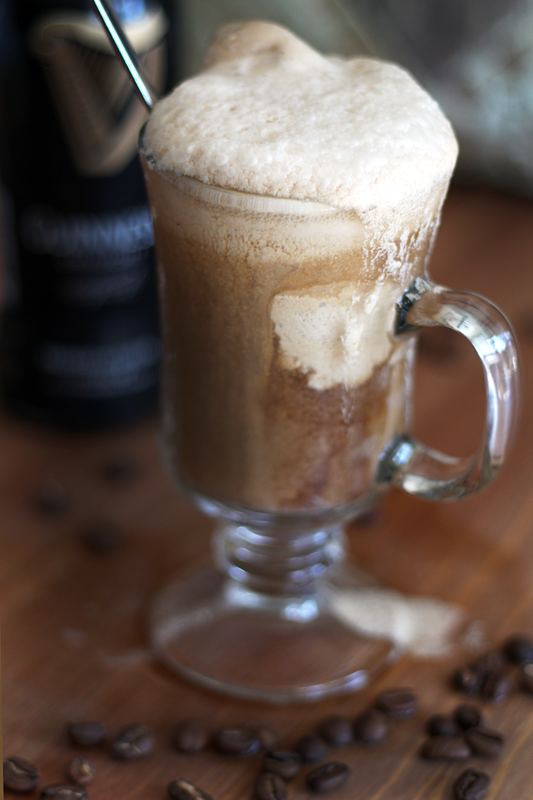 An ice cream maker is necessary to make my dairy-free coconut coffee ice cream, but you could still enjoy a dairy-free Guinness Float this St. Patrick’s Day by substituting some store bought vanilla ice cream like SO Delicious Coconut Frozen Dessert Vanilla Bean. What’s that you say? You don’t like Guinness?! It’s okay. 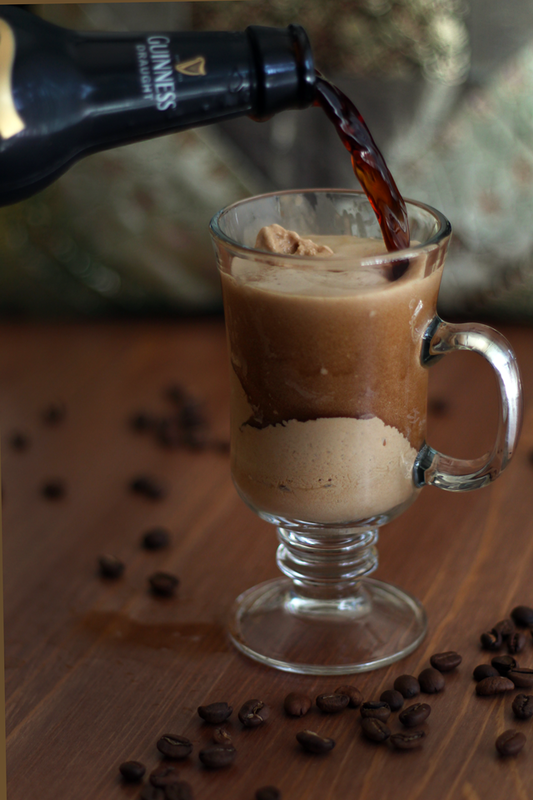 Put your coffee ice cream in a cup of coffee or some cola instead! Drink with a green straw. 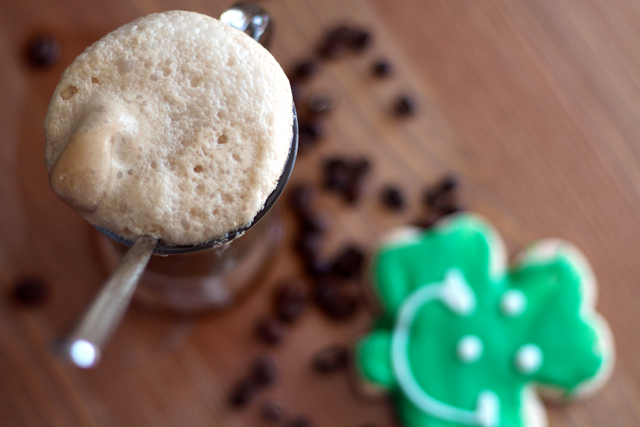 Or enjoy with one of those cute little shamrock cookies from Eat’n’Park. My brother brought them to me all the way from Pittsburgh, but you can order them online! Happy St. Patrick’s Day! Add coffee and sugar to a medium bowl and mix together. Open cans of full fat coconut milk. Solid part should be at the top if fully chilled. 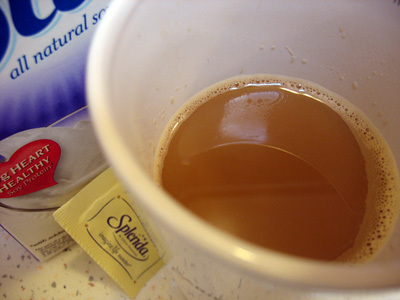 Leaving the cream in the can, drain only the light liquid coconut milk into the bowl of coffee and sugar. Add vanilla as well. Whisk until sugar is dissolved. Prepare your ice cream maker. Stir the coconut cream remaining in the can into the coffee/milk mixture until well blended. Immediately pour into ice cream maker. Let mix for 25-30 minutes. Freeze for 1 hour to harden or use soft. Scoop desired amount of ice cream into a tall glass. Slowly pour Guinness over top of the ice cream. Enjoy.